Enguerrand Quarton's 'Pietà of Villeneuve-lès-Avignon' is considered the greatest artwork of 15th-century France. 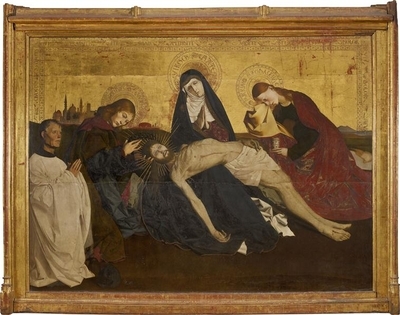 Standing before the painting known as the "Pietà of Villeneuve-lès-Avignon," visitors to the Louvre witness the heartbreaking moment when the bruised body of Jesus Christ, having been taken down from the cross, has been given to his mother. It is a common scene, rendered by hundreds of artists in thousands of ways over the centuries, with those by Giotto, Michelangelo and Annibale Carracci among the most renowned. 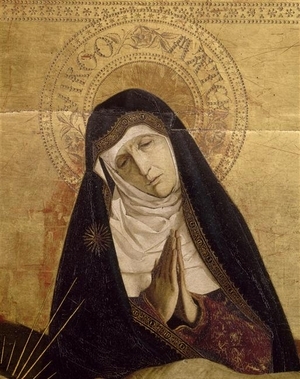 This one, painted by Enguerrand Quarton (c. 1410-1466), would surely be as celebrated had it not been hidden in a dark, provincial chapel, its creator unknown and then disputed, for so long. Among many art historians, the "Pietà of Villeneuve-lès-Avignon" (c. 1445) is considered the greatest artwork of 15th-century France. Original in many aspects, it conveys not just sorrow and spirituality but also, especially in Mary, acceptance of God's plan for his son and hers. The painting was discovered in 1834 by a young inspector of historical monuments named Prosper Mérimée—later the author of "Carmen," the novella that inspired Bizet's opera. Mérimée found it in a church in Villeneuve-lès-Avignon, a little town on the Rhone opposite Avignon. Decades then passed before it was shown in Paris at the 1904 Exhibition of French Primitives, which featured some 700 works of medieval and early Renaissance art. The next year, it was purchased for the Louvre. More time would elapse before Quarton was credited. Born in Laon, in the north of France, he had moved to Provence by at least 1444 (and probably before), where he became a prominent painter and illuminator. Quarton, familiar with Italian and Flemish art as well as French Gothic style, is known for two documented paintings: "The Virgin of Mercy" (1452) and "The Coronation of the Virgin" (1453-54), both more colorful, exuberant, highly detailed works that on first glance may seem unlike the stark, somber "Pietà." But in 1959, Charles Sterling, a scholar of 15th-century French art who worked as a curator at the Louvre and then, part-time, at the Metropolitan Museum of Art, dated it and identified Quarton as the author. He noted resemblances in the facial bone structures and the long fingers of the figures in the three works, parallels in the drapery of their clothing, and other stylistic similarities, and he matched the portrayal of the patron in the "Pietà" with a similarly attired one in "The Coronation." Quarton's haunting "Pietà" places Mary at the center. She is, unusually, old and weary. Her face is wrinkled, her nearly closed eyes have bags and her skin is as pale as her dead son's. 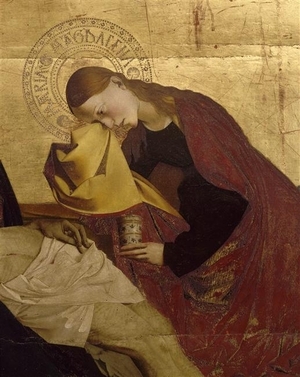 Rather than being held in her arms, as in so many other depictions, he rests on her knee. She is the voice for the Latin inscription from Lamentations on the painting's perimeter: "Oh, all you who pass on this road, look and see if there be any suffering like mine." Yet, with her hands folded in prayer, she is resigned to the sacrifice she has just witnessed and experienced. She aches in silence. Steps away from Mary—one on either side—are St. John the Evangelist and St. Mary Magdalene. Like her, they are encircled with golden halos stamped with their names. They are youthful; there is color in their cheeks. John stoically cradles Christ's head with one hand and gently removes the crown of thorns with the other—an unusual sight. Over his shoulder, in the distance and against a gold background, lies the city of Jerusalem. Mary Magdalene, her red hair trailing down her back, is still crying. Wiping her tears on the sculpted golden folds of her mantle, whose sheen is matched by that of the white underside of Mary's cloak, she plays her traditional role of anointing the body with oil, drawing from a jar decorated with stars. Christ's thin, arched body, against the dark blue of Mary's mantle, heightens the painting's drama. Quarton has paid close attention to anatomy, as can been seen in Christ's scarred rib cage, knees and feet. A trickle of blood flows from the wound in his side, but none oozes from his head, which is ringed by golden rays signifying his divinity. Throughout the painting, there are rhythmic spatial interrelationships. Christ's right arm parallels the diagonal of his legs, which is echoed in the tilt of Mary's head and the slant of Mary Magdalene's body. Hands are angled to parallel Christ's body or point to Mary. The heads of the main figures form an arc that is reflected back in Mary's hem. In fact, the painting would be nearly symmetrical were it not for the presence of the donor, dressed in canonical white, kneeling at left. The painting, which measures more than 5 by 7 feet, contrasts with its overwrought neighbors of the same period in the Louvre, and therein lies its unusual power. It is a portrait of unspeakable grief achieved with unimaginable restraint.